Tall tomato varieties are also known as indeterminate and cordon, and are traditionally the most popular – not least because of the huge choice of shapes and sizes of tomatoes that they produce. For the beginner, perhaps the most difficult part of growing tall varieties is knowing which bits to remove. The side shoots are the bits that are usually pinched out – also known as suckers. Here’s a short video that explains where they grow and how to remove them. Tall varieties can be grown in containers of a large size, but the most popular is the grow bag. 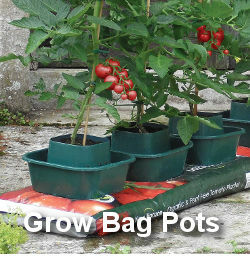 Grow bags are ideal for tall varieties and can be adapted and improved upon using grow pots and other added extras. Here’s one method of using large pots sunk into a grow bag and a pot in the middle for watering. Feeding is done by applying diluted nutrients around the bottom of the stems where the fine roots grow. This is similar to using grow pots which are sunk into grow bags and plants are then fed through the inner ring and watered through the outer ring – also known as ring culture. 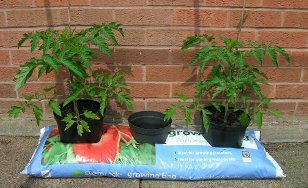 Perlite and other extras can also be added to grow bags which can be used in the greenhouse, around the patio and even sunk into the garden border. 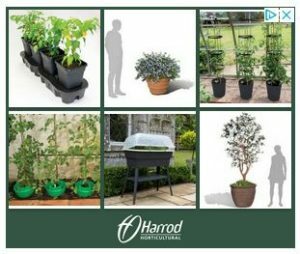 It is important to remember that tomatoes are best grown in compost/soil that is new and bought from the garden centre. Grow bags are containers that come with disease free soil – perfect for growing tall varieties. All sorts of diseases and bugs lurk in the garden soil that will kill the sensitive tomato plant. Tall varieties also need to be stopped. This is done by pinching out the growing tip of the main stem after a certain amount of trusses have formed – how many trusses you have on your plants depends on a number of situations. If you are growing outside you would normally allow four trusses in the UK and five or six in a warmer climate. In the greenhouse, between five and seven trusses is fine. Some varieties take longer to mature than others – especially some of the larger, beef stake ones, so if you allow too many trusses you may find that the tomatoes on the lower trusses take longer to mature and also their size may be reduced. Removing the lower leaves is a good idea because it helps air circulation around the base of a plant and old decaying leaves can encourage bugs and disease. As lower leaves (below the first truss) begin to yellow, remove them as you would side shoots. Leaves may be removed gradually up to the first truss, then above the first truss after the first truss is producing ripe tomatoes. Deleafing a plant to quickly and removing too many leaves can result in a poorer harvest – not a better one as some ebooks recommend. However, I’m a great believer in testing for myself – so if you like to experiment, test it out and see the results on one of your plants. We have grown tomatoes this year, for the first time. The plants are 4ft tall and covered in trusses of green tomatoes. Is it too late to remove any now? Also, they have all grown heart shaped, although they are ordinary round tomatoes on the label. Is there a reason for that? I’m sorry but I can’t remember what variety they are now and it’s too dark to go out in the garden to see. Hope you can help. If not we’ll have to wait until next year for a bumper crop of juicy tomatoes. There is still time for the green tomatoes to ripen, if they don’t you could pick a few and put them in a bowl with a ripe banana to ripen. As for the shape, sometimes tomatoes don’t always produce the shape expected if the original seed was not reliable and perhaps crossed by a bumble bee. Thank you for your quick answer. Could you tell me if we should maybe remove a lot of the higher trusses, with smaller tomatoes, to allow the lower ones to do better? We have about a dozen trusses in all. Hi NICK, thanks for all the info on tomatoes , i have a good crop of tomatoes , but a bit worried they are not redening up atall, can i ripen them another way. thank you for your time in helping us amatures. Hi Brian, The only thing you can do is to keep feeding them tomato food. If they are already picked, you can put them in a bowl with a ripe banana and the gas from the banana speeds ripening. A truss is a branch that grows out of the main stem of a tall variety, on which are the tomatoes. Thanks Nick for such an informative website. Living in a flat in central London, I am growing a tall variety in my bathroom (plant was given to me when it was about 2cm high and I didn’t know anything about types! ); it’s doing very well – now getting towards 70cm…it has produced 5 fruits (still green at present) and there are now also 5 trusses of buds. I noticed that roots are starting to come out of the 25cm pot… should I repot it, or is it going to stress it, or encourage more foliage? A 25cm or 10inch pot is big enough for one plant and it is quite normal to see roots coming from the bottom of a pot this size when the plant is well developed. If you wanted to, you could sit the pot in a larger container of soil or grow bag, then the roots would have somewhere to go. However, there is no need to repot it – just feed it regularly with tomato food. I would probably leave things as they are. Brilliant…. I have been doing some of this stuff differently or at different times, now I can experiement a bit more aswell. Pleased you like the website! Bless you for taking the time to describe the terminlogy to the starters!